This is a new kit designed for creating your own hand held or simply portable spot curing rig. At the heart of it is three SG-1-20 bulbs. These are 20" long, 1.5" in diameter, use 100w rated lamp ends like the big SG-1 lamps, the same phosphors and reflector system. It is literally a small version of the exact same lamp, so it can go places a 6 foot bulb can't. Next, we power this in a very special VHO mode using one of our favorite power sources, the Workhorse 8. 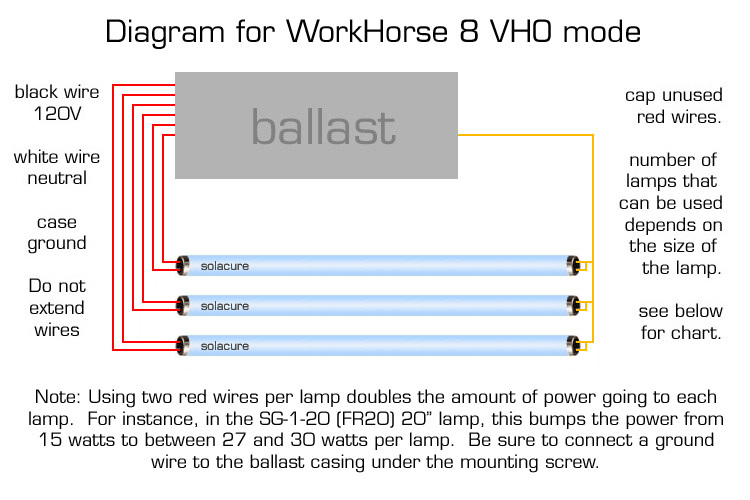 Then we DOUBLE the standard power by using two red leads per lamp instead of one, so you are running in VHO mode (Very High Output). This pushes you to 27 watts in a 15 watt package (don't worry, the lamp can handle even more than this, it is that tough). The ballast is around 19" x 1" x 2", aluminum casing and has all the wire you will need, except for connecting to the 120v power source. We also include 6 heavy duty lamp ends. These are surface mount, single screw style. You can throw together a frame from aluminum "L" or "C" channel, using a couple of self-tapping, flat bottomed screws, connect any AC power cord and have a hand held device in an hour. Because the ballast is about the same length as the bulbs, it is trivial to connect to the same frame. Just add a handle and you are in business, with around 90w worth of extremely high efficiency UVA plus a touch of UVB to prevent bubbling. And since each lamp has its now built in reflector, you can make an open frame, or any frame for that matter, and not have to worry about any type of reflector system: We've taken care of that for you. This also a great way to add UV in the bottom or top of a UV curing chamber that uses the 6 or 4 foot SG lamps, and will match the spectrum 100% for guaranteed perfect curing results. The kit price is just the standard price of the components. We do add a length of wire free, to make chaining easier. You build the frame, we have the parts. You may want to print this out for use when your kit arrives.